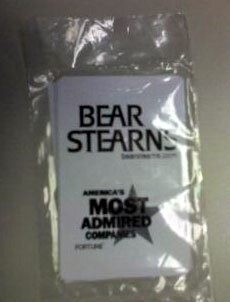 Here’s one of the more awesome pieces of Bear Stearns memorabilia that’s been on eBay recently. It’s an imprinted three card monte card set. As noted by the seller, it’s even imprinted with a Fortune magazine America’s Most Admired Companies imprint as well. I’m not an expert on three card monte, but I think it’s kind of a lot like taking a bunch of subprime loans and shuffling them around with a bunch of other securities until no one can tell where they are anymore.